Undeniably the most famous and arguably the best swordsmith in Japanese history was Goro Nyudo Masamune. Masamune was trained by swordsmiths from Bizen and Yamashiro and his main teacher was Kunimitsu. Masamune made his name when in preparation for a third Mongol Invasion he created a stronger sword and pioneered a double quenching process for hardening steel. This brought him fame and drew many would-be disciples to his door for training. Masamune produced his best work in Kamakura, Sagami province in the 1320's. Today there are very few samples of swords actually signed by Masamune and most of the extant work are tantos rather than katana. 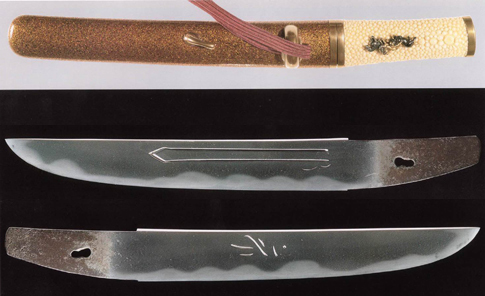 Examples of signed works accepted as genuine are the "Fudo Masamune", "Kyogoku Masamune", and "Daikoku Masamune". 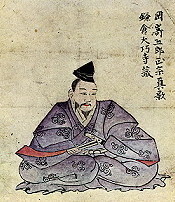 His works are the most frequently cited among the swords listed in the Kyoho Meibutsu Cho, a catalogue of excellent swords in the collections of daimyos edited during the Kyoho era by the Hon-ami family of assessors. Masamune trained many disciples who all went on to become very famous smiths in their own rights. Masamune had ten brilliant students who gathered from various regions of Japan, namely Rai Kunimitsu, Hasebe Kunishige, Kaneuji, Kinju, Yoshihiro, Norishige, Naotsuna, Bizen Kanemitsu, Chogi, and Sa.